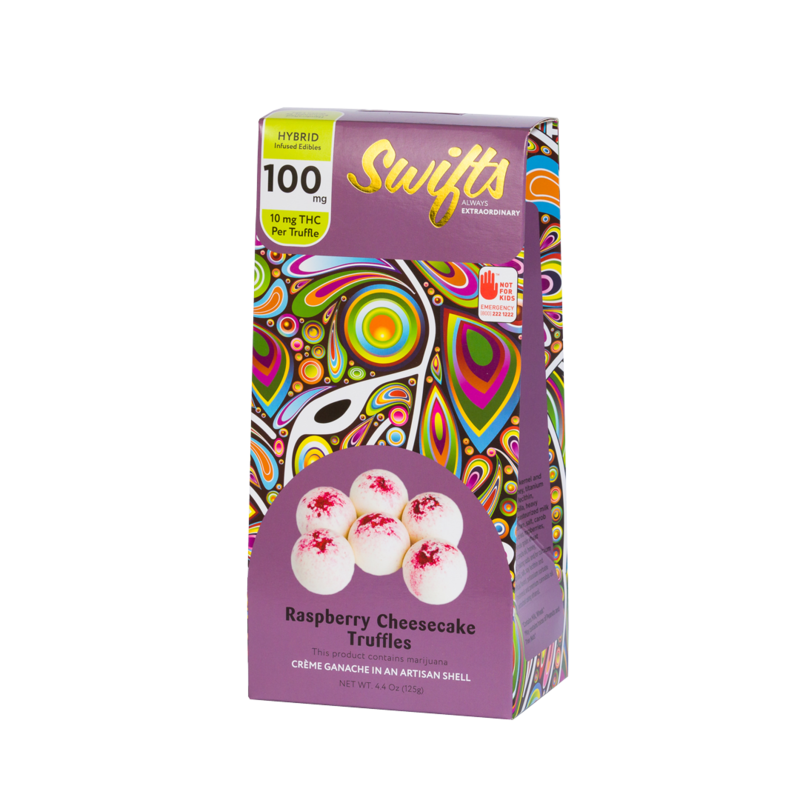 When life hands you a bag of Swifts chocolates, step outside of the box and turn the music up. The rich whipped crème chocolate ganache, wrapped in an artisan shell, melts the day away leaving you deliciously free. Ingredients: Sugar, cocoa butter, palm kernel and palm oils, nonfat milk, whey, titanium dioxide color, sunflower lecithin, natural flavors, pure vanilla, heavy cream, cream cheese (pasteurized milk and cream, cheese culture, salt, carob bean gum), freeze dried raspberries, graham flour [whole grain wheat flour], sugar, canola oil, honey, leavening [baking soda and/or calcium phosphate], salt, soy lecithin and artificial flavor, potassium sorbate (freshness) and premium cannabis oil extracted using ethanol. Contains Milk, Wheat. May contain traces of peanuts and tree nuts. Upon getting a job at the local dispensary I found myself gravitating towards our edibles section. Not contented with the traditional brownie and cookie options, I migrated to your single serve truffles. I was not expecting much when I opened the package and the raspberry scent started to hit me but as I bit into it I was pleasantly surprised. Very tasty little treats, and just as effective if not more. Try them in pancakes, home baked cookies, brownies - you won't regret it. I will defiantly be getting more for my next lazy Sunday in!